Welcome back to the April issue of the Bangkok Travelbug! This month we feature the Chai Nat Muni National Museum in Chai Nat, one of the historical and cultural attractions in the province. 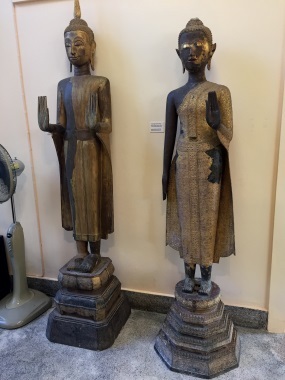 The museum, located in the premises of Wat Phra Borommathat Worawiharn, is a depository of invaluable Buddha images, votive tablets and other historical relics dating back for centuries. This was through the efforts of a former abbot of Wat Phra Borommathat Worawiharn who had patiently collected these relics for years. Let's find out more about this museum. Phra Chai Nat Muni (name as a layman, Nuam Suthatto) was born in Tambon Thiang Thae, Amphur Sankhaburi, Chai Nat Province on 24 April 1893 on the 10th night of the 6th Lunar month in the Year of the Small Snake. He was the fifth in a family of six siblings. When he became the abbot of Wat Ban Kluai in 1926, he did a lot to develop the temple facilities for the benefit of the monks and the local residents. He was appointed abbot of Wat Phra Borommathat Worawiharn in 1950 and held various positions in the Buddhist Council in Chai Nat culminating in the position of Chief Abbot of Chai Nat. In 1955 he was honoured by the royal visit of King Rama IX and Queen Sirikit who made a donation to Wat Phra Borommathat Worawiharn. For his service to Buddhism and the community, he was awarded the revered title of Phra Chai Nat Muni in 1956. Phra Chai Nat Muni loved to collect old Buddha images, votive tablets and other historical relics and over the years he amassed a huge collection in the monastery. In 1966 he donated his entire collection of Buddha images, votive tablets and historical relics to the Fine Arts Department. 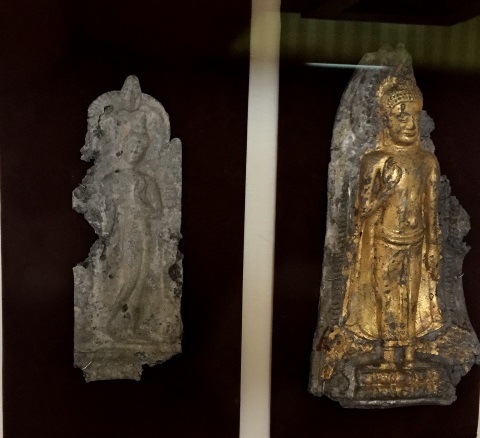 A museum was built on the premises of Wat Phra Borommathat Worawiharn to display these relics. 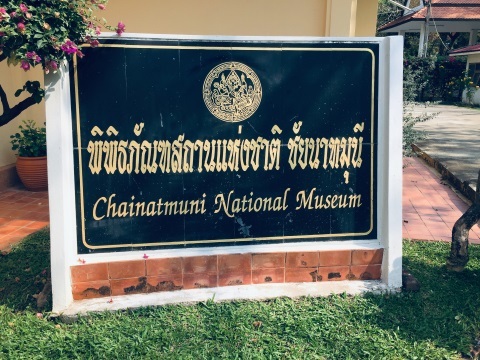 Appropriately the museum was named Chai Nat Muni National Museum, after the benefactor and was opened to the public in 1969. Phra Chai Nat Muni passed away in 1973 at the age of 80. The Chai Nat Muni National Museum remains his legacy to posterity. 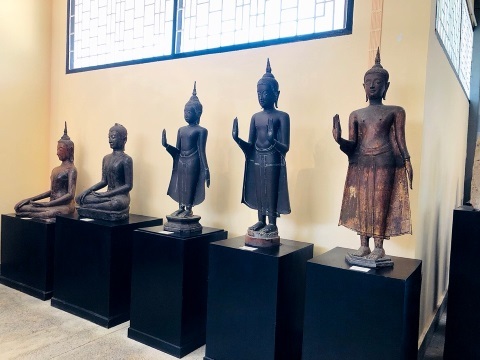 The first floor of the Chai Nat Muni National Museum covers the Buddha images through the centuries, scripture cabinets and old Chinese ceramics. 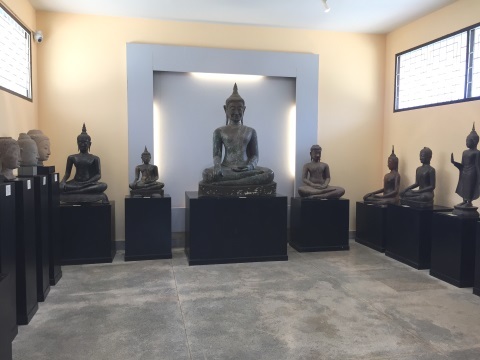 This museum is more than just a museum of Buddhist art, the Buddha images here, most of which were found in Chai Nat, and the pre-historic artefacts on display are a record of the history of the province. 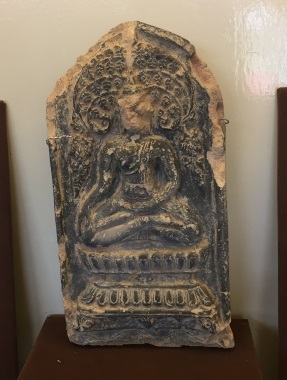 We will start with the older displays first, like this stone carving depicting Buddha between the Wheel of Law¹ and a stupa² dating back to the Dvaravati³ era from 7th – 9th C AD. ¹The Wheel of Law or Dharma Wheel represents of the teachings of Buddha. The eight spokes represent the Noble Eightfold Path in the teachings of Buddha. ²Stupa (pronounce sa-tup) is a conical structure that is considered the most important architectural structure in Buddhism as it was built to serve as the burial mould holding the ashes of Buddha. ³Dvaravati is an ancient Buddhist culture that had an influence on Central and North-eastern Thailand between the 6th – 9th C AD. 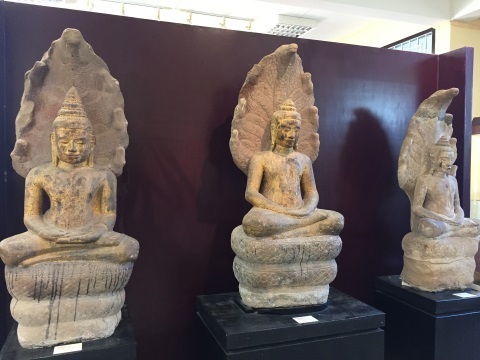 These images from the Lopburi era date back to the 12th C AD. 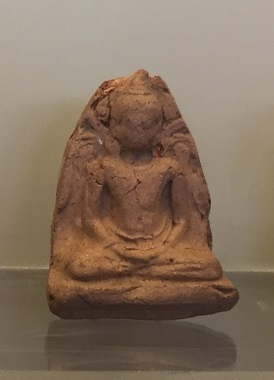 This popular posture of the Buddha image symbolises an event in the life of Buddha six weeks after achieving enlightenment. Suddenly there was a heavy downpour. Naga the serpent coiled his body around Buddha and spread his hood over Buddha's hear to protect him from the rain. 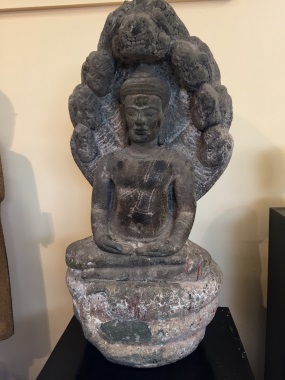 This form of Buddha image is Khmer art, Bayon style found in Cambodia. 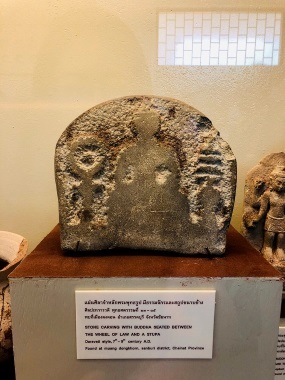 The 12th – 13th C was also the period when Lopburi was one of the fringe provinces of the Angkor Empire, which explains the influence of Khmer art of these Buddhist images. 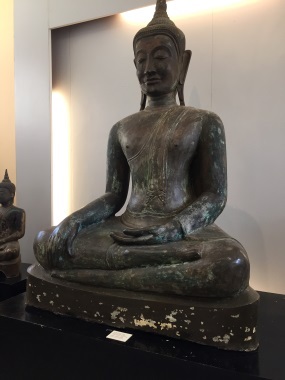 This is another common posture for Buddha images found in Thailand, Buddha subduing Mara or "calling the Earth to witness". Buddha is meditating to achieve enlightenment when Mara and his army of demons tries to tempt and lure Buddha away from the path of righteousness. 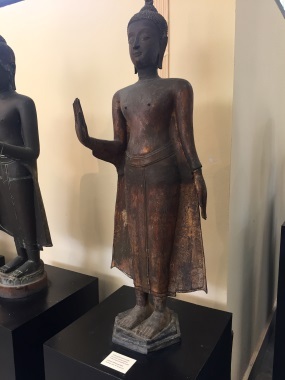 Buddha refuses to succumb to the temptations; he points the fingers of his right hand to the ground to call Chao Mae Toranee, the Earth Goddess to come to his assistance. Chao Mae Toranee answers Buddha's call, she wrings the water from her hair and causes a torrent of water to sweep Mara and his army of demons away. This posture can be depicted in the standing or seated positions, with left or right hand raised or both hands raised. The posture with the left hand raised symbolises the event when Buddha restrains his family members from fighting over the rights to the water from a drying river. The posture with both hands raised, "calming the ocean", signifies the event when Buddha raised both hands to stop the rising waters from a river from flooding the banks. The posture with the right hand raised signifies the event when Buddha calmed a raging elephant in his path, he touched the elephant's trunk and the animal bowed on his knees in submission. 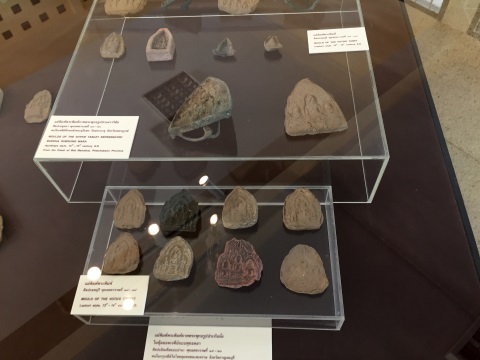 The second floor of the museum displays votive tablets found in archaeological sites from the Dvaravati period to the present Rattanakosin period. A votive tablet is made from a slab of malleable clay on which a design is stamped on with a pre-cast mould. The slab of clay is baked till it hardens. Like Buddha images, these tablets are used for religious purposes and have been made through the various eras. 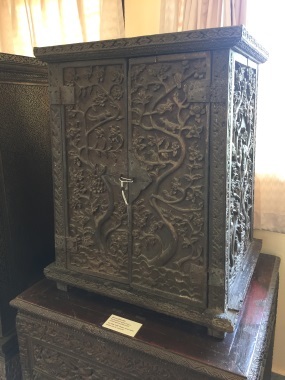 The early votive tablets in India date back to the 3rd C BC and depict symbols like the lotus flower⁴, Bodhi tree⁵ and Wheel of Law to represent Buddha. ⁴The lotus flower signifies purity in Buddhism, though its roots are in muddy waters, the lotus rises above the mud to bloom pure and fragrant. A lotus flower in full bloom signifies enlightenment. ⁵Buddha attained enlightenment while sitting under the Bodhi tree. 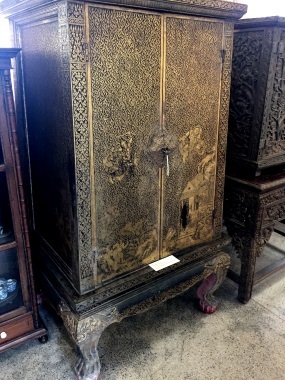 Votive tablets in Thailand date back to the 6th C AD during the Dvaravati period. These later tablets depict images of Buddha in various postures. 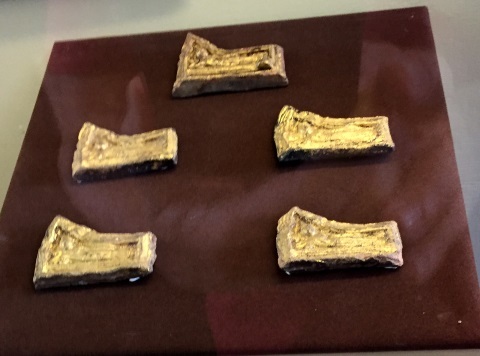 Here are some samples of the displays of votive tablets in the Chai Nat Muni National Museum. Buddha adopted this posture, legs crossed, both hands on the lap palms facing up with right hand over the left, to meditate till he achieved enlightenment. The reclining posture depicts Buddha's last moments on earth, before achieving Nirvana to be freed from the cycle of death and rebirth. Because Buddha achieved enlightenment in his life time he was spared the endless cycle of birth, death and rebirth. 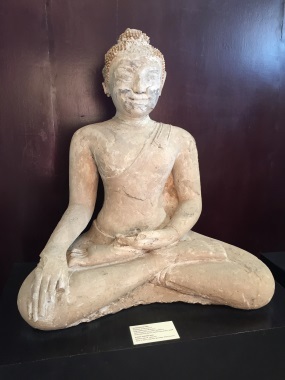 The vast collection of Buddha images, votive tablets and historical artefacts in the Chai Nat Muni National Museum is a repository of Buddhist art that preserves the history of Buddhism and civilisation in Thailand. There are two possible routes to Chainat from Bangkok. Highway 338 – highway 9 – highway 340 to Suphanburi – continue on highway 340 till you get to Chainat. Distance – 196 km. Alternatively, you can take Don Muang Tollway – highway 1 – highway 32 past Ayutthaya, Singburi – highway 1 to Chainat. Distance – 199 km. Other hotels are included in the map to give visitors a wider choice. If you enjoyed reading this e-zine, please forward it to a friend. If you received this from a friend and found it interesting, please subscribe at Bangkok Travelbug. What do you think of the Bangkok Travelbug? 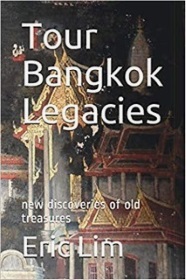 For those who prefer reading printed books rather than e-books, here's a handy paperback, Tour Bangkok Legacies, which will help you along as you explore the streets of Bangkok and discover its old treasures. 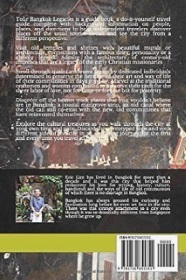 It's complete with historical descriptions and directions on how to get to these places.